The Brazilian Agouti (Dasyprocta leporina aguti), is one of the free roaming creatures that you will catch a glimpse of when Moody Gardens’ Rainforest Pyramid® exhibit reopens in May 2011! This relative of the guinea pig is found in the rainforests of Brazil and it is the only mammal that is known to crack a Brazil nut with its teeth. Brazil nuts, fruits, vegetables and greens are the typical food staples for the Agouti. 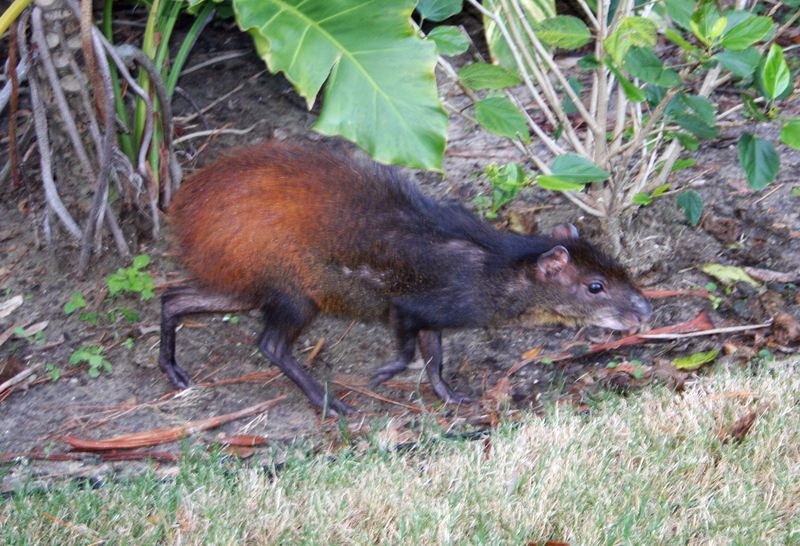 The Agouti is a member of the rodent family, but unlike most rodents it walks on its toes and not flat footed. It can also jump up to six feet in the air from a standing position. Talk about air time! In the Amazon rainforest the Agouti is the only species responsible for reseeding the forest with Brazil nuts, which ensures the growth of a whole new generation of trees. They do this by hiding seeds in various locations around their territory. In the wild, Agoutis are very shy and nervous animals that often live in burrows or hollowed out tree trunks to avoid predators. They survive through their keen sense of hearing and it’s said they can even hear fruit hitting the rainforest floor! The Agouti is fairly social within their species. They often live and travel in small family groups and even pairs during mating season. Check out our video featuring our new Agouti here! Previous Previous post: Love is in the air at Moody Gardens!